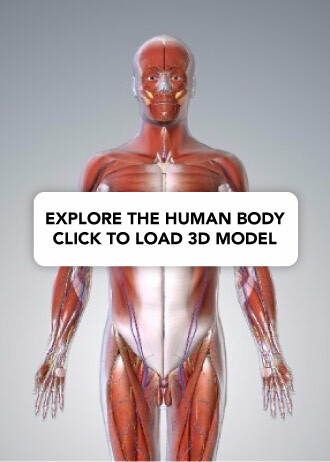 Forms a firm, yet flexible boundary which keeps the abdominal viscera in the abdominal cavity and assists the viscera in maintaining their anatomical position against gravity. Protects the abdominal viscera from injury. Assists in forceful expiration by pushing the abdominal viscera upwards. Is involved in any action (coughing, vomiting, defecation) that increases intra-abdominal pressure. The anterolateral abdominal wall consists of four main layers (external to internal): skin, superficial fascia, muscles and associated fascia, and parietal peritoneum. In this article, we shall look at the anatomy of the anterolateral abdominal wall – its musculature, surface anatomy and clinical correlations. Above the umbilicus – a single sheet of connective tissue. It is continuous with the superficial fascia in other regions of the body. Below the umbilicus – divided into two layers; the fatty superficial layer (Camper’s fascia) and the membranous deep layer (Scarpa’s fascia). The superficial vessels and nerves run between these two layers of fascia. Fig 1 – The layers of the anterolateral abdominal wall. 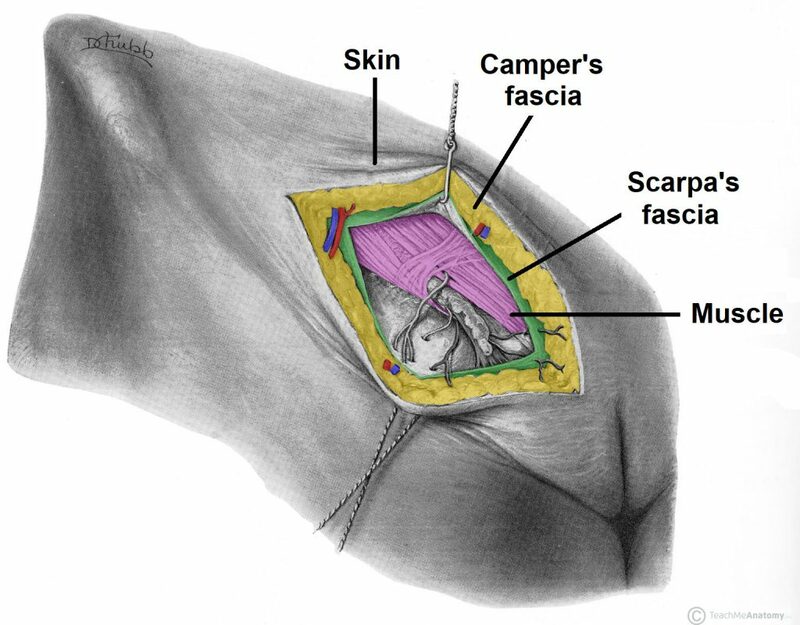 Below the umbilicus, there are two layers of superficial fascia – Camper’s and Scarpa’s. Flat muscles – three flat muscles, situated laterally on either side of the abdomen. Vertical muscles – two vertical muscles, situated near the mid-line of the body. There are three flat muscles located laterally in the abdominal wall, stacked upon one another. Their fibres run in differing directions and cross each other – strengthening the wall and decreasing the risk of abdominal contents herniating through the wall. In the anteromedial aspect of the abdominal wall, each flat muscle forms an aponeurosis (a broad, flat tendon), which covers the vertical rectus abdominis muscle. The aponeuroses of all the flat muscles become entwined in the midline, forming the linea alba (a fibrous structure that extends from the xiphoid process of the sternum to the pubic symphysis). The external oblique is the largest and most superficial flat muscle in the abdominal wall. Its fibres run inferomedially. Attachments: Originates from ribs 5-12, and inserts into the iliac crest and pubic tubercle. Functions: Contralateral rotation of the torso. Innervation: Thoracoabdominal nerves (T7-T11) and subcostal nerve (T12). The internal oblique lies deep to the external oblique. It is smaller and thinner in structure, with its fibres running superomedially (perpendicular to the fibres of the external oblique). Attachments: Originates from the inguinal ligament, iliac crest and lumbodorsal fascia, and inserts into ribs 10-12. Functions: Bilateral contraction compresses the abdomen, while unilateral contraction ipsilaterally rotates the torso. Innervation: Thoracoabdominal nerves (T7-T11), subcostal nerve (T12) and branches of the lumbar plexus. Fig 2 – The muscles of the anterolateral abdominal wall. Note how the flat muscles form aponeuroses medially. The transversus abdominis is the deepest of the flat muscles, with transversely running fibres. Deep to this muscle is a well-formed layer of fascia, known as the transversalis fascia. Attachments: Originates from the inguinal ligament, costal cartilages 7-12, the iliac crest and thoracolumbar fascia. Inserts into the conjoint tendon, xiphoid process, linea alba and the pubic crest. Functions: Compression of abdominal contents. There are two vertical muscles located in the midline of the anterolateral abdominal wall – the rectus abdominis and pyramidalis. The rectus abdominis is long, paired muscle, found either side of the midline in the abdominal wall. It is split into two by the linea alba. The lateral borders of the muscles create a surface marking known as the linea semilunaris. At several places, the muscle is intersected by fibrous strips, known as tendinous intersections. The tendinous intersections and the linea alba give rise to the ‘six pack’ seen in individuals with a well-developed rectus abdominis. Attachments: Originates from the crest of the pubis, before inserting into the xiphoid process of the sternum and the costal cartilage of ribs 5-7. Functions: As well as assisting the flat muscles in compressing the abdominal viscera, the rectus abdominis also stabilises the pelvis during walking, and depresses the ribs. This is a small triangular muscle, found superficially to the rectus abdominis. It is located inferiorly, with its base on the pubis bone, and the apex of the triangle attached to the linea alba. Attachments: Originates from the pubic crest and pubic symphysis before inserting into the linea alba. Functions: It acts to tense the linea alba. The posterior wall is formed by the aponeuroses of half the internal oblique and of the transversus abdominis. Approximately midway between the umbilicus and the pubic symphysis, all the aponeuroses move to the anterior wall of the rectus sheath. At this point, there is no posterior wall to the sheath; the rectus abdominis is in direct contact with the transversalis fascia. The demarcation point where the posterior wall ends is called the arcuate line. Many of the organs in the abdominal cavity can be palpated through the abdominal wall, or their position can be visualised by surface markings. The umbilicus is the most visible structure of the abdominal wall and is the scar of the site of attachment of the umbilical cord. It is usually located midway between the xiphoid process and the pubis symphysis. The rectus abdominis muscle gives rise to abdominal markings. The lateral border of this muscle is indicated by the linea semilunaris, a curved line running from the 9th rib to the pubic tubercle. The linea alba is a fibrous line that splits the rectus abdominis into two. It is visible as a vertical groove extending inferiorly from the xiphoid process. Transpyloric plane – horizontal line halfway between the xiphoid process and the umbilicus, passing through the pylorus of the stomach. Intertubercular plane – horizontal line that joins the superior aspect of the iliac crests. Vertical planes – run from the middle of the clavicle to the mid-inguinal point (halfway between the anterior superior iliac spine of the pelvis and the pubic symphysis). These planes are the mid-clavicular lines. 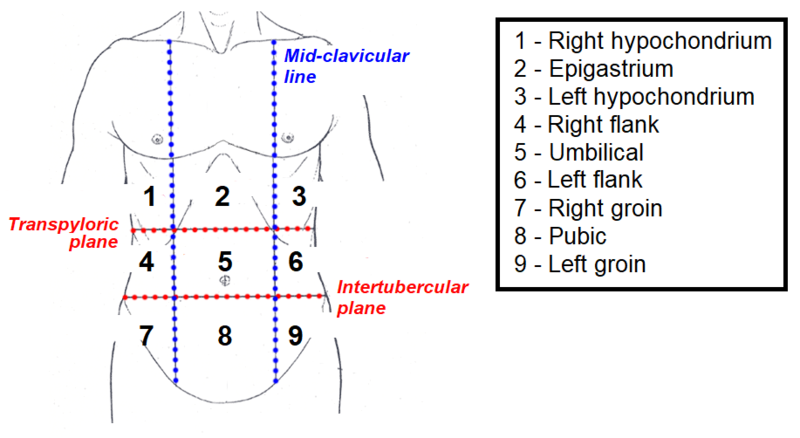 Fig 3 – The nine regions of the abdomen. An incision that is made through the linea alba. It can be extended the whole length of the abdomen by curving around the umbilicus. The linea alba is poorly vascularised, so blood loss is minimal, and major nerves are avoided. It can be used in any procedure that requires access to the abdominal cavity. Similar to the median incision, but is performed laterally to the linea alba, providing access to more lateral structures (kidney, spleen and adrenals). This method ligates the blood and nerve supply to muscles medial to the incision, resulting in their atrophy. A Kocher incision ③ begins inferior to the xiphoid process and extends inferolaterally in parallel to the right costal margin. It is mainly used to gain access for gall bladder and/or biliary tree pathology. Mercedes Benz incision or modification ⑤ – the Chevron incision with a vertical incision and break through the xiphisternum. This may be used for the same indications as the Chevron incision, however classically seen in liver transplantation. A McBurney is a called a ‘grid iron’ incision, because it consists of two perpendicular lines, splitting the fibres of the muscles without cutting them – this allows for excellent healing. McBurney incision is performed at McBurney’s point (1/3 of the distance between the ASIS and the umbilicus) and is used in an open appendicectomy. 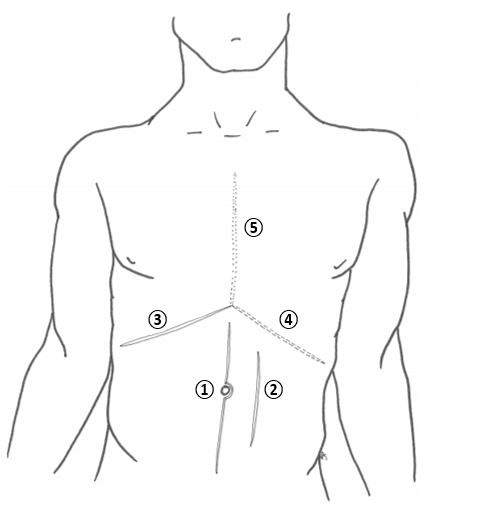 Fig 4 – Common abdominal incisions. ① Midline incision, ② Paramedian incision, ③ Kocher incision, ④ Rooftop modification and ⑤ Mercedes Benz modification. What forms the most internal layer of the anterolateral abdominal wall? Which of the following abdominal wall muscles contains vertically orientated fibres? 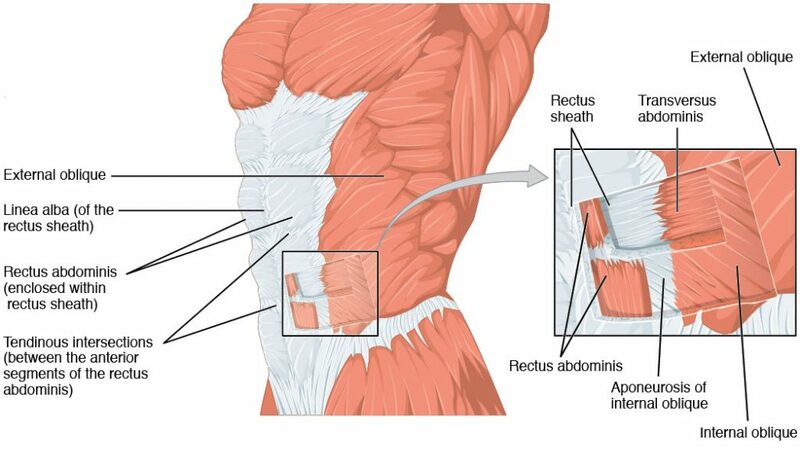 What is the name of the line below which the rectus abdominis comes in direct contact with the transversalis fascia?